After a long drought without movie news, Cassandra Clare has shared some pretty exciting news. We have an Alec and we have an Isabelle. This will probably be up on Deadline and all the other good places soon enough, but Sony told me I could spill the news so I AM GOING TO. I’ve been traveling and doing Dark Artifices research in Italy and Vatican City so I wasn’t hiding from y’all, but it is nice to come back with BIG FUN NEWS TO SHARE. 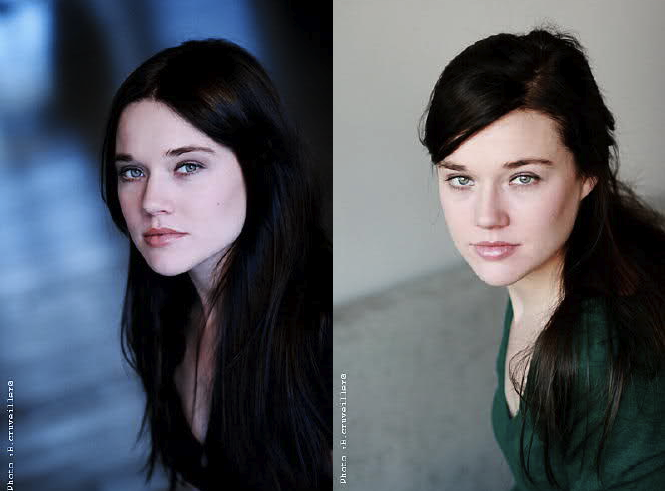 Jemima West (The Borgias) has been cast as Isabelle Lightwood in The Mortal Instruments: City of Bones. Jemima West. She’s beautiful (like whoa) and really talented. You can see her as Vittoria on The Borgias right now. And before anyone freaks out that she is blonde, she’ll be dying her hair for the role. 🙂 She had a lot of Izzy’s toughness and directness in her audition. I like her. Clare confirmed that Phoebe Tonkin, who was a fan favorite for the role, did in fact audition for Isabelle. Basically, I got a call from the studio that Alec and Izzy were confirmed and to go ahead and blog about it. I got through blogging Izzy and got a call saying “Hold off on Alec.” So I waited, and I just got off the phone again and basically: I can’t tell you who Alec is because — well, I don’t entirely know why, but it has to do with his schedule, and telling could get a bunch of people shot. Or something. I am not entirely sure; Hollywood moves like molasses except when it moves like gunpowder and calls me back halfway through a Tumblr post. Do NOT stay up waiting for this news: it could actually be a few days, though I am going to be optimistic and hope for shorter. For those asking about all the other parts: there are actors under serious consideration for every major part at this point. Just because Alec and Isabelle’s contracts got finished first doesn’t mean they aren’t in the middle of casting everyone else. I go back to Vatican City and hide in the Popemobile. In the meantime, at least enjoy that Izzy is cast, she’s great, and we’re on the downward slope: there WILL be more casting news and it’ll be soon and it’ll be cool. Lily Collins (Clary) and Jamie Campbell Bower (Jace) are also attached to star. Filming is slated to begin on August 15 in Toronto. The Mortal Instruments: City of Bones is slated for an August 23, 2013 theatrical release. What do you think of Jemima? OMG ! I LOVE Jemima West !!! Im sooo glad ! Hope she will color her black though.. or not ! i dont know ! IM JUST SO HAPPY ! Alec..British…Could it be Nicholas Hoult? ..maybe? maybe not?xD not expecting much..
Omg Nicholas boult please be u!!!! Can’t wait !! I wasn’t so sure about her as blonde! But i’ve just saw her photos on tumblr with brown hair… and OMG! Well she said we’d know them soo maybe prob not I doubt him or Robert patterson want another YA series…. What other actors are British!? Ahh! I think she’s gorgeous! There’s been rumour on Tumblr that it’s Ed Westwick as Alec. She’s really pretty!!! Now…. who is alec!!!! CC was told to hold off that info for some reason!!! im dieing here!!!!! Oh MY GOSH! FINALLY SOME NEWS I AM SOOO FRICKEN EXCITED!!! She is beautiful! If Cassandra likes her, I like her! It finally feels very realistic, now that they have another person casted. Now I really want to know who Simon and Alec is!! This is killing me. Who was cast as Alec? I can’t think of any other actors we’d know besides the ones she named. Oh, and love the choice of Isabelle. I’ve seen her current show and I could totally see her as Isabelle. Andrew Garfield I have my money on. His british. Brown hair. Maybe? Could Tom Sturridge be Alec??! I hope it’s not too much longer until we find out who the rest of the cast is. Wow! this cast so far is awesome Lily & yes Jamie too. Maybe Max Irons could be Alec?… I think he auditioned for the part of Jamie but maybe they liked him as Alec. He got brown hair, pretty well known, is british, and made out with Ben Barnes in Dorian Gray! I could see him as Alec for sure! OMG! mercy please. Alec, this is the role I was waiting for and I can’t even know who the hell is he yet! It’s absolutely phenomenal that we finally got casting news after such a long wait! And you know what? Going by the people they’ve chosen so far, TMI is going to have one hell of a good-looking and talented cast! Wow, I just love her! She’s perfect for Isabelle, I can’t wait to see it! you know this is really getting annoying. i think she will be great and so does cassandra! She did create the world and characters! This is is her vision. wow that’s where jemima’s from! i watched one or two episodes from the first season and then decided it was boring but maybe I could get into it again cuz of her! i love her as Izzy! noo..noooooo they got it alwrong i wanted adelaide kane whose younger and prettier and more of an isabelle to me shes discribed as tall and slim and b y the looks of it lilly collins is much more taller than her for some reason i’ve always imagined that jade girl from victorios as isabelle im a the only one??? i looove who they chose for Clary and Izzy! not so sure about Jamie as Jace but for all the other movies all the fans didnt like the cast. like for harry potter, twilight, and the hunger games. but then they pulled through and everyone looved them. so im sure Jamie will do great! cant wait to find out who plays Alec and Simon!!!! … Colin Morgan? He might be able to portray Alec, though he always looks slightly happy, so maybe not. Never mind, I think he’s Scottish.